Be the first to share your favorite memory, photo or story of Theo. This memorial page is dedicated for family, friends and future generations to celebrate the life of their loved one. 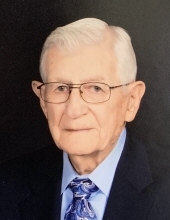 Theo Dwight Owen, 89, of New Boston, Texas passed away Wednesday, February 6, 2019 at a Texarkana, Texas hospital. Dwight was born February 15, 1929, in Lubbock, Texas to James Wilson and Daisy Louise Elliott Owen. He was a retired Chief of Production for Red River Army Depot and a member of First Baptist Church in New Boston, Texas. Dwight was a veteran of the United States Military, a member of the American Legion, the New Boston Masonic Lodge #69 and a life member of the NRA. He was preceded in death by his parents; one son, Randle Keith Owen; and three brothers, Joe Wendell Owen, Bobby Lee Owen and James Maxwell Owen. He is survived by his wife, Mary Frances Owen of New Boston, Texas; one son and daughter-in-law, Gary and Floriene Owen of New Boston, Texas; one daughter and son-in-law, Vickie and Jack Newkirk of Leary, Texas; two brothers and one sister-in-law, Elliott and Linda Owen of Spring Branch, Texas and Kenneth Owen of Nash, Texas; two sisters and one brother-in-law, Frances Ruth Reid of Oklahoma City, Oklahoma and Patricia and Burl Minter of Simms, Texas; five grandchildren, J.T. Townley, Casey Cribbs, Alexandra Townley, Joshua Owen and Kaylea Wardlaw; five great grandchildren; and numerous other relatives and friends. Services will be 3:00 P.M. Saturday, February 9, 2019 at First Baptist Church in New Boston, Texas with Dr. Patrick Hunter and Dr. Ken Cox officiating. Interment will follow at New Boston Cemetery in New Boston, Texas under the direction of Bates Family Funeral Home in De Kalb, Texas. Visitation will be held 2:00 P.M. to 3:00 P.M. Saturday, February 9, 2019 at First Baptist Church in New Boston, Texas. Memorials may be made to First Baptist Church, 506 S. McCoy Blvd., New Boston, TX 75570 or the charity of your choice. To send flowers or a remembrance gift to the family of Theo Dwight Owen, please visit our Tribute Store. "Email Address" would like to share the life celebration of Theo Dwight Owen. Click on the "link" to go to share a favorite memory or leave a condolence message for the family.